Cemental tear represents a rare form of root surface fracture which makes teeth prone to periodontal breakdown. The diagnosis of cemental tear becomes a challenge as it is usually neglected or misdiagnosed and is also underreported in the literature. Correct diagnosis and early treatment of cemental tear can prevent further periodontal breakdown and may preserve the affected tooth for a longer duration. This case presents the diagnosis, treatment, and an analysis of a right maxillary lateral incisor with an improper endodontic treatment coupled with a cemental tear. 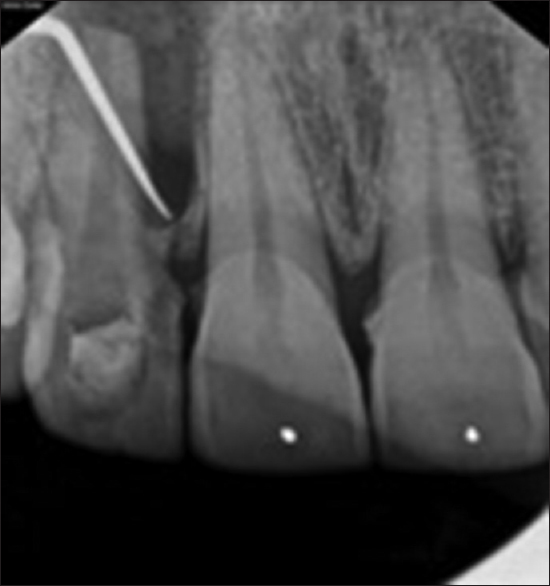 Despite surgical removal, the cemental tear led to the development of an endodontic periodontal lesion. This article intends to help recognize early signs and symptoms of cemental tear and establish timely diagnosis. It determines that if the periodontal destruction caused by cemental tears is diagnosed and treated early, it may be possible to prevent further periodontal breakdown and preserve the tooth for a longer period. Cemental tears are under-reported in the literature due to their atypical features, lack of knowledge, and difficult diagnosis. Presently, there are only a few articles, mostly as case reports with not much emphasis on clinical management with proper follow ups of such cases. Although the etiology of cemental tear has not been clearly established, it is believed to result from attrition, trauma from occlusion, dental trauma, and aging., The purpose of this article is to report the dilemma in diagnosis and in the treatment of a right maxillary lateral incisor having improper endodontic treatment, coupled with cemental tear which appeared radiographically as a detached fragment in the middle third of the root. Although the fractured root fragment was removed by a periapical surgery, it did not result in healing and an endodontic periodontal lesion persisted. If the periodontal destruction caused by cemental tears is diagnosed and treated at an early stage, it may be possible to prevent further periodontal breakdown and to preserve the tooth for a longer period. The present case describes diagnosis, contemporary management modality, materials used for healing of lesion and follow up of maxillary right lateral incisor. A 34-year-old male patient with a chief complaint of pain in the upper front tooth was referred for an endodontic evaluation of tooth #12 to the Division of Conservative Dentistry and Endodontics in 2013. The patient presented with a history of trauma and endodontic treatment in the same tooth 2 years before his visit to our speciality clinic. The patient also exhibited attrition with respect to the anterior teeth. On clinical examination, the tooth was discolored and was tender on percussion with Grade II mobility. After patients consent, the access cavity preparation was present palatally. 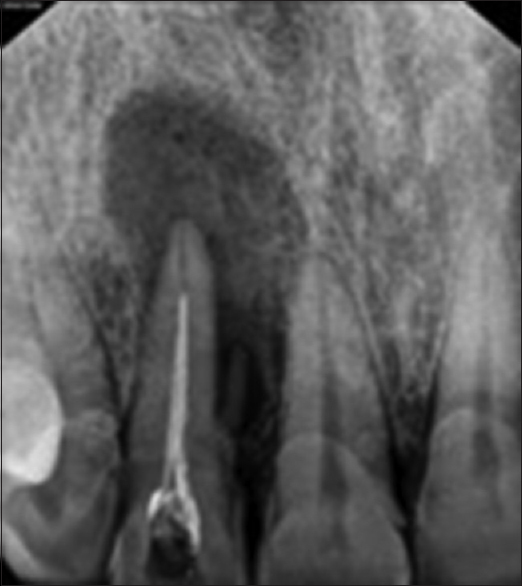 A periodontal pocket of more than 10 mm was present on the mesial aspect of the tooth. The radiographic examination revealed an improper and inadequate obturation with respect to #12 with a large periapical radiolucency [Figure 1]. The periradicular radiolucency measured approximately 10 × 11 mm in size. In addition, the radiograph revealed a peculiar calculus-like radio-opaque spicule on the mesial aspect of the tooth initiating from the cemento-dentinal junction to the middle third, surrounded by an independent radiolucency. The spicule was attached at the coronal end and was separated from the root surface apically. 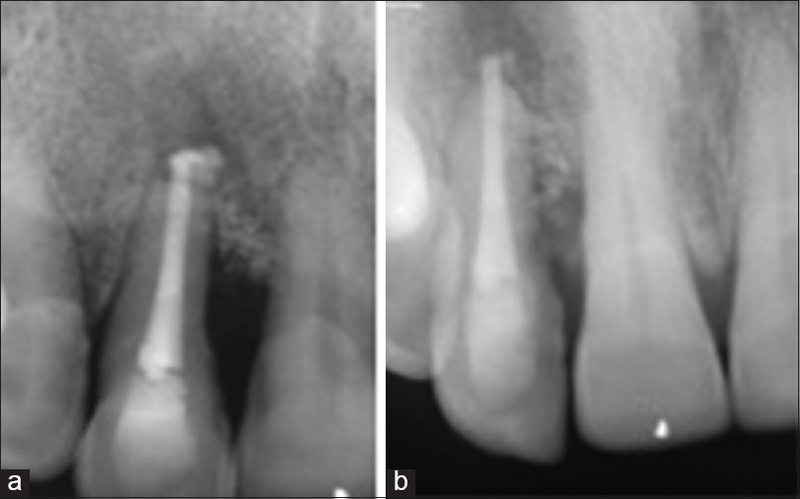 Based on the symptoms, clinical presentation, and radiographic examination, a provisional diagnosis of a periapical lesion associated with failed endodontic treatment coupled with cemental tear associated and subsequent endodontic-periodontal lesion was made. The radio-opaque spicule was identified as cemental tear as it had a peculiar feature of being attached at the coronal end of the root surface and then showed detachment of the root surface as it moved apically. The persistence of periapical lesion was attributed to the improper endodontic treatment while the cemental tear was ascribed to be the cause of lateral radiolucency associated with shallow scooped out lateral root surface due to traumatic occlusion. Treatment was started by removing the previous root canal filling using a #30 Hedstrom file, followed by thorough disinfection of root canal system by copious irrigation with sodium hypochlorite (1% NaOCl Dentpro, Mohali, India). Calcium hydroxide (Ammdent, Mohali, India) was placed in the root canal serving as an intracanal medicament. The intracanal medicament was changed 2 times in a span of 2 weeks. Thereafter, surgical removal of the diagnosed cemental tear and apicoectomy with respect to tooth #12 was carried out after a week. After patient's consent, under local anesthesia, a full-thickness mucoperiosteal flap was raised. On raising the flap, a torn cemental fragment could be visualized. This was found to be firmly attached to the root surface. It was excised using burs and ultrasonic equipment along with copious irrigation [Figure 2]. 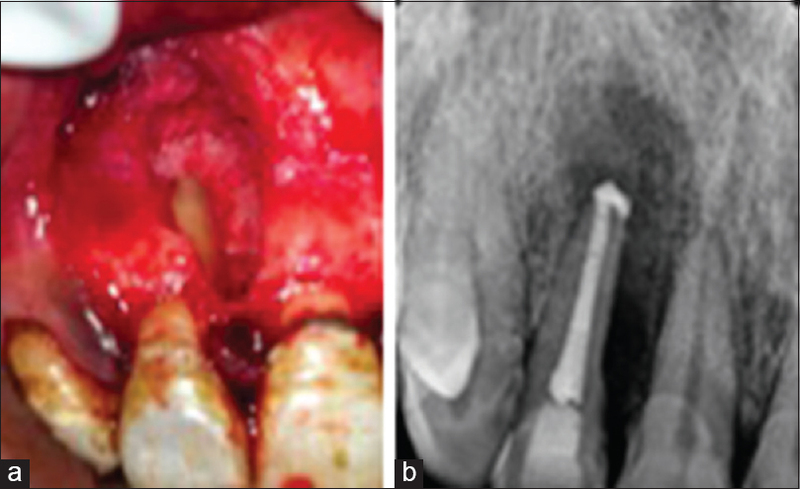 This was followed by conditioning of the root surface with tetracycline and apicoectomy of the affected tooth [Figure 3]a. Subsequently, mineral trioxide aggregate plug (Dentsply; Tulsa Dental, Tulsa, OK, USA) was placed in the apical portion followed by backfilling with thermoplastisized gutta percha [Figure 3]b. The patient was kept under Observation. After 6 months, the tooth was found to be asymptomatic but with the presence of Grade II mobility. In most of the case reports usually the periodontal healing occurs after the removal of cemental tear, except in this case, and hence it was decided to proceed with regenerative surgery. In 2014, a second-stage surgery was performed for regeneration and reattachment of the periodontal ligament. After the patient's consent, local anesthesia was administered, intrasulcular incisions were made, and buccal full-thickness mucoperiosteal flaps were raised. Granulation tissue was removed from the intraosseous defects, and the roots were scaled and planed thoroughly with Gracey curettes (# 13 and 14, Hu-Friedy, Chicago, Illinois, United States) and ultrasonic instruments to remove residual mineralized deposits. After conditioning with tetracycline, bonegraft (flexible hydrogel-hydroxyapatite), platelet-rich fibrin was placed in the defect [Figure 4]a and [Figure 4]b. The patient was asymptomatic and mobility was significantly reduced during the first 6 months of follow-ups [Figure 5]a. At two-year follow-up, after the second stage regenerative surgery, significant periodontal healing and reduced pocket depth (4 mm) and decrease in the size of radiolucency could be appreciated and the patient was asymptomatic [Figure 5]b.
Cemental tear is often misdiagnosed as solely a periodontal or apical lesion, resulting in failure even after periodontal and root canal treatment. In the present case, the etiology of cemental tear was trauma. Moreover, along with cemental tear, there must have been involvement of pulp due to trauma. Previous root canal therapy had failed due to incomplete obturation which additionally led to further increase in the size of the lesion, ending up in a concurrent endodontic and periodontal diseases with communication. Only a few reports on cemental tear have been reported in the literature till date, its cause has not been interpreted completely. Lin et al. reviewed past articles and identified age, trauma, occlusal overloading, thicker cementum, higher fragility of cementum and previous periodontal treatment as possible etiological factors. In trauma, often with excessive force application on the teeth and periodontal ligament (PDL) being stressed too much, the fibres could lead to separation of cementum from dentine as cementum is embedded in the sharpey's fibres. The clinical features for cemental tear varies from single or multiple characteristics of either deep periodontal pocket, tooth mobility or bleeding on probing which has also been seen in the present case. Jeng PY et al. has summarized the general clinical features of cemental tear. The pulp response is often vital. But non-vital is possible due to misdiagnosis. Clinical picture may present periodontal or apical bony destruction. Cases with cemental tear will usually be unresponsive to endodontic treatment along with presence of sinus tract, gingival swelling and exudate. It can affect multiple teeth along with the possibility of recurrence. If the cemental tear is not treated properly and on time it may lead further bone destruction and ultimately would lead to extraction. The literature supports the relation of age and the occurrence of cemental tear. According to the study of Lin et al., among 71 patients, 10 (14.1%) were over 80-years-old, 29 (40.9%) were between 70 to 80 years, 13 (18.3%) were 60 to 70-years-old, and 19 were below 60 years. In the present case report, the patient is below 60 years of age, contrary to the reports in literature where cemental tear has been reported to be mainly occur in older patients (age, >60 years). The possible relation of age to cemental tear can be that in elderly the cementum ages in time and the adhesion of proteoglycan (between cementum and dentine) decreases. In addition, the function of collagen is to restrict the stretching of periodontal ligament (PDL). When the extension of PDL is not controlled properly, it may exert extensive or inadequate force on cementum and contribute to the separation of cementum from dentin. In the present case tooth involved was maxillary lateral incisor. Literature suggests that incisors are the major affected teeth. Attrition has been reported as a predisposing factor for cemental tear. In the present case, the patient exhibited attrition of the anterior teeth which could be attributed one of the predisposing factor for the occurrence of cemental tear along with trauma. In the present case, the patient gave a history of trauma by a hand pump 6 years ago. The tooth had previously undergone root canal treatment and pus discharge was evident from the gingival sulcus. Radiograph showed a large periapical lesion associated with an incomplete obturation. This presentation, along with the clinical features of periodontal breakdown, attrition and history of trauma, lead to the diagnosis of cemental tear which was evident as a radiopaque spicule on the radiograph. Unfortunately, during the surgical exploration the torn cementum could not be retrieved for biopsy. The treatment of cemental tear involves non-surgical scaling and root planing, surgical debridement with apical/ periodontal surgery, surgical debridement combined with guided tissue regeneration (GTR) and bone graft, and extraction. In the present case, the root canal therapy alone without removing the fragment would have given unpredictable results. Therefore it was planned to carry out root canal therapy followed by apicoectomy and removal of the cemental tear. By raising the flap the fragment can be easily visualised and removed followed by regenerative procedures, hence promoting reattachment of the periodontal ligament. This treatment option attempts to promote periodontal/apical tissues regeneration and allowing for functional retention of the affected tooth. In the present case we understand the healing of #12 is only satisfactory which could be attributed to poor patient compliance to maintaining oral hygiene. But, after weighing the options for extraction of the anterior tooth against saving the tooth for a patient, it seemed valuable to treat the tooth with cemental tear even if they have marked periodontal or periapical bony destruction. It has been found in the literature that in majority of cases, cemental tear occurs in vital teeth and root canal treatment has been shown to have no or very less association with cemental tear. However, there are studies which have shown the failure of endodontic treatment for several teeth with cemental tear., These points indicate that in the present case there are more chances of cemental tear to exist prior to the endodontic treatment which the local dentist may have failed to recognise. This, coupled with the improper endodontic treatment, lead to the development of an endodontic periodontal lesion in the presence of cemental tear. The present case is a rare case of a combination of cemental tear with presence of a periapical lesion associated with a non-vital tooth leading to an endodontic-periodontal lesion which was caused as a result of combination of traumatic injury and traumatic occlusion. Root canal therapy using MTA plug and backfilling with gutta-percha along with root end surgery helped the periapical lesion to heal. Regenerative surgery done using Flexible hydrogel-hydroxyapatite bone graft. Platelet rich fibrin helped in periodontal repair by regenerating the bone. Hence, proper diagnosis and precise treatment planning will help such lesions to heal well with good prognosis. The authors are grateful to Professor Ajay Logani and Dr. Vijay Kumar, Assistant Professor (Division of Conservative Dentistry and Endodontics), All India Institute of Medical Sciences, New Delhi, for their valuable guidance and support. Chou J, Rawal YB, O'Neil JR, Tatakis DN. 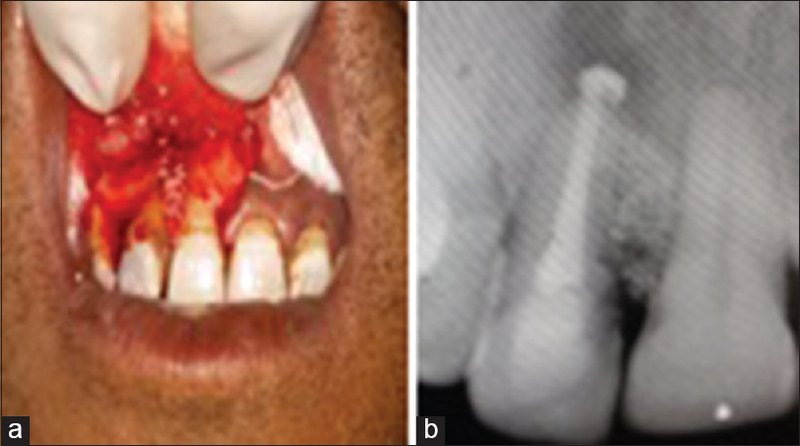 Cemento dentinal tear: A case report with 7-year follow-up. J Periodontal 2004;75:1708-13. Tulkki MJ, Baisden MK, McClanahan SB. Cemental tear: A case report of a rare root fracture. J Endod 2006;32:1005-7. Lin HJ, Chan CP, Yang CY, Wu CT, Tsai YL, Huang CC, et al. Cemental tear: Clinical characteristics and its predisposing factors. J Endod 2011;37:611-8. Lyons CT, Peacock ME, Cuenin MF, Swiec GD, Dickey DJ. Severe localized periodontal destruction associated with cervical cemental separation. Gen Dent 2005;53:212-4. Tai TF, Chiang CP, Lin CP, Lin CC, Jeng JH. Persistent endodontic lesion due to complex cement dentinal tears in a maxillary central incisor: A case report. Oral Surg Oral Med Oral Pathol Oral Radiol Endod 2007;103:e55-60. Leknes KN, Lie T, Selvig KA. Cemental tear: A risk factor in periodontal attachment loss. J Periodontal 1996;67:583-8. Lin HJ, Chang MC, Chang SH, Wu CT, Tsai YL, Huang CC, et al. Treatment outcome of the teeth with cemental tears. J Endod 2014;40:1315-20. Jeng PY, Luzi AL, Pitarch RM, Chang MC, Wu YH, Jeng JH. Cemental tear: To know what we have neglected in dental practice. J Formos Med Assoc 2018;117:261-7. Lin HJ, Chang SH, Chang MC, Tsai YL, Chiang CP, Chan CP, et al. Clinical Fracture site, morphologic and histopathologic characteristic of cemental tear: Role in endodontic lesion. J Endod 2012;38:1058-62. Camargo PM, Pirih FQM, Wolinsky LE, Lekovic V, Kamrath H, White SN. Clinical repair of an osseous defect associated with cemental tear: A case report. Int J Periodont Restorative Dent 2003;23:79-85. Ishikawa I, Oda S, Hayashi J, Arakawa S. Cervical cemental tears in older patients with adult periodontitis. Case reports. J Periodontal 1996;67:15-20.